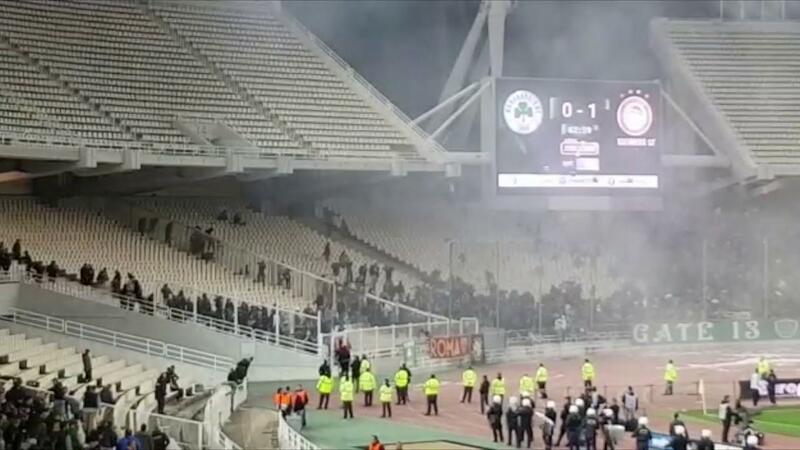 The new sports law in Greece was applied for the first time after yesterday’s episodes that led to the interruption of the football derby between Panathinaikos and Olympiakos. The eight arrested persons that were admitted to the prosecutor’s office were charged with misdemeanor offences and a ban on entry into the stadiums was issued. This is the first time that is put in force in Greece this particular law that was coincidentally passed last week, which provides for stricter treatment of those arrested for conduction episodes in stadiums. At the same time, a file is being formed to investigate malicious acts against unidentified so far offenders, mainly through the feed of the security cameras. The implementation of the new law solves a fundamental problem: When someone was being brought to the prosecutor’s office due to participation in episodes in a stadium, he could not be banned from entering a stadium until the trial, which could take place many years later. Today, based on the new framework, any violation of the public prosecutor’s order leads to imprisonment, while allowing the possibility of additional penalties, such as the mandatory appearance of the accused in police stations. This development comes in the wake of an outbreak of fan violence in Greece, as serious clashes have occurred that have resulted in injuries both inside and outside the stadiums. Yesterday’s development seems to have been the “final drop” and is a crash test for the implementation of the new law. “At last, the perpetrators must be punished to send messages to all directions”, the minister said. Serious episodes had occurred last year in Thessaloniki, including the invasion in the stadium of the president of PAOK, which led to the deduction of points and the loss of the championship. It should also be noted that the Tsipras administration is in open conflict with the owner of the football team Olympiakos, Vagelis Marinakis, who controls the municipality of Piraeus, with SYRIZA accusing him of close having ties with Kyriakos Mitsotakis and of providing support to the ND. Demonstration in Tirana, opposition’s scenario, violent and peaceful?